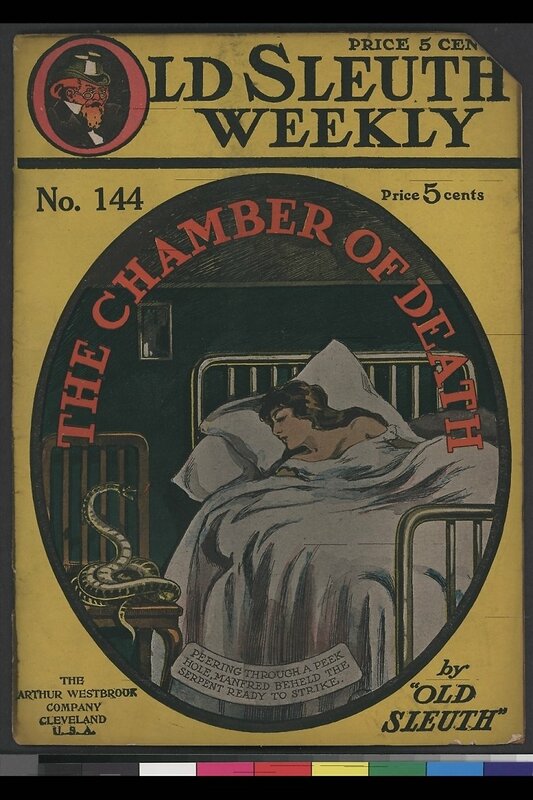 Some folks at Stanford have put together a lovely online compendium of public domain work--art from Dime Novels and Penny Dreadfuls. In addition to the 8,000 individual images, it includes an overview of old printing processes for reproducing artwork. While we're on the topic, a number of publishers use Lulu to sell editions of dimestore novels, including ERBvillePress (see also erbvillepress.com), Wild Cat Books, Dennis McHaney and Bircham Studio. Kevin Kelly, the original editor of Wired, offers a bracing tour of how we saw the Web at its inception, and what it has really become, "We Are the Web" (Wired, August 2005). The scope of the Web today is hard to fathom. The total number of Web pages, including those that are dynamically created upon request and document files available through links, exceeds 600 billion. That's 100 pages per person alive. How could we create so much, so fast, so well? In fewer than 4,000 days, we have encoded half a trillion versions of our collective story and put them in front of 1 billion people, or one-sixth of the world's population. That remarkable achievement was not in anyone's 10-year plan. Does Kelly overstate the historic significance of the Web? I doubt it, as breathless as his account may seem. I love this essay even though he gets the number of books published last year wrong (using the 2003, rather than the 2004 Bowker figures), and seems to swipe the notion of, if not the term, authorgeddon without attribution. He affirms the fundamental strengths of the Web--its unpredictability and democracy and growth--and reminds us of the ways in which it dwarfs all previous mediums in its virtues and its potential. A quick but important update to my post earlier this week responding to the NYT story on Amazon.com's purchase of Booksurge: Google has announced that offering a search engine for video is not the end of its ambitions; it also plans to allow the creators of video content to upload, and even sell, their work through Google: See "Google Preps Video Distribution Service." Sounds awfully familiar, if you haven't been following the official Lulu blog lately. Here's a link to the Google video uploader. On a side note, when I published the print version of the Gutenberg Project's Underground City, by Jules Verne, I also submitted it to the Google Print program using the Google book tool. So far it hasn't shown up in search results. USA Today sticks a foot into the "long tail" fray today (without mentioning the long tail theory specifically, mind you) with this article on the revolution in independent publishing: "Making Mini-Spielbergs," which comes with a helpful infographic and mini-story that should be all about Lulu, but for some odd reason isn't: "Self-Publishing Made Easy." I'm glad this topic has gained momentum recently, and I'm still waiting for Time or Newsweek to take note of the fact that Bob Young, the man who first rode the open source phenomenon to riches, is now applying the same principles to publishing. But on the other hand, the niche-publishing angle (see this recent piece on Noveau Niche in the newsletter Trendwatching) is not entirely new. One of the best reports I ever heard or read on this topic was a series that NPR reporter Rick Karr did three years ago called "TechnoPop: The Secret History of Technology and Pop Music." The Amazons, EBays and iTunes of the world have broken through the distribution bottlenecks. Increasingly, their endless aisles of shelf space hold not just the manufactured hits of the traditional media and entertainment powers but also the remarkably diverse output of countless niche producers. Each may not sell a lot, but together they represent a cultural force that can rival the mass market. Anderson also mentioned it in his blog, which as usual drew some good comments. The site offers the ability to order "8" X 10" color Fujix prints - in glossy or matte finish - from digital captures between 300 dpi and 400 dpi are available for purchase at $30.00 per print," which makes me wonder who exactly will be reaping the profits from the sale of these images--presumably the NY library and its delivery & fulfillment partner. I wonder if it is Zazzle? I couldn't tell from the order process, although it seems unlikely in that Zazzle offers a much greater range of delivery options. The collection includes a section I plan to revisit often, Classic Illustrated Zoologies and Related Works, 1550-1900, and where I hope to find the inspiration for next year's Umstead Trail Marathon logo (an event I help coordinate each year). The NYT reports today on efforts by Evan Williams, one of the original Blogger founders, and Noah Glass to mount yet another attempt at creating a digital marketplace: "For a Start-Up, Visions of a Profit in Pod-Casting." Odeo arises out of the recent fad of podcasting, but has broader (and more strategically sound) ambitions as well. The article notes that companies like Audible (which is also getting into the Podcasting business) are already booming because of "the rapid proliferation of iPods and other handheld MP3 devices that are capable of playing digital audio files containing news, music and talk radio, as well as an increasingly diverse array of amateur productions that are more difficult to categorize." Odeo plans to base its business on the premise that the explosion of digital audio content has created the need for a central place to find relevant material and that there will also be a need for a market to buy and sell "premium" content in much the style of the eBay online marketplace. Odeo, noting that advertising is already an accepted component of conventional radio, also plans to embed automatically generated audio ads within the downloadable files. Finally, it's worth noting that commercial success is not the only (or even main) reason to be a Long Tail producer. Most authors write books not to get rich but to reach a readership, whether it be to enhance their academic reputation, market their consultancy, or just leave a mark on the world. The Long Tail effect may not pay their rent, but it will find them a bigger audience, and if what they're offering is really good it may be dramatically bigger. Via Publishers Lunch comes this tidbit from The Roanoke Times: "Students lobby for more open textbook market ." Coincidentally, today is the day we sent out a press release on a new book written by St. Petersburg Community College professor Matt Basham, who became famous by giving away a book he wrote on Cisco certification for network administrators. Another article was posted by the Stanford Daily. Google's big announcement about working with some of the world's largest libraries to scan their entire collections (Google page) has received plenty of attention (NYT piece) today, as well as a growing body of commentary far more erudite than anything I could come up with. But the two pieces that caught my attention this afternoon were John Battelle's entry in Search blog and the short piece in Publishers Lunch. Both note that Google is in a position to offer out of print texts--according to published accounts, Google estimates that 90% of the scanned books will be out of print material--in print on demand editions with the click of a button on your search results. It is, of course, a most provocative idea. Battelle suggests that he is aware of a company in a position to provide such a service. A company that is not Lulu? What does he know that I don't? Anyone? Google's strategy at this point appears to be the "acquisition" of an infinite amount of virtual real estate for advertising space--what with the print program, gmail, and all the other content advertising initiatives. Their current revenue model supports this, but their ambition and vision suggest broader goals. They appear for example, with Froogle, to be competing with Amazon.com. I have seen various suggestions as to Google's possible future revenue strategies--subscription-based access, commissions on sales-- but nothing convincing. They think far enough in the future to be genuinely enigmatic, which is an enviable position. So now anyone can control, create, market, distribute, find, and interact with anything they want. The barrier to entry to media is demolished. Media, always a one-way pipe, now becomes an open pool. And, most important, the centralization of media -- the marketplace, the network, the monopoly -- is replaced by a decentralized universe. This changes everything. It changes the relationships. It changes the economics. It changes the power. I think, by the way, that he is dead wrong about the "shared experience" of media having had such a short life. He is deliberately downplaying the downside of the decentralization of media on the culture, but that's his schtick. He's paid to be optimistic. Well, Slashdot finally got around to covering the on-demand software projects launched by Lulu on Halloween. Following the comment thread so far, opinions seem mixed.